All chimineas are going to get hot when in use. Some hotter then others but none the less if there's fire its hot. 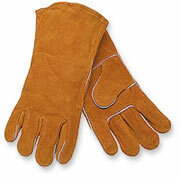 These gloves are made to with stand hot steel making them the perfect match for a chiminea. When adding firewood to a cast iron chiminea these gloves are a must. When you add the firewood you have to open the door and put the wood inside. If you accidentally touch the side of the chiminea without these gloves you'll get burned. The CHIMINEA GLOVES are extra long in length allowing you to reach inside the chiminea and be protected! With these chiminea gloves I have personally picked up burning logs before without getting burnt. Not for long but i did! The CHIMINEA GLOVES are 14" long!